EnergyGuard Acrylic Elastomeric Caulk is a brush grade, high solids, acrylic elastomeric roof sealant and caulk. Caulking and sealing sheet metal fasteners, seams, laps and flashings prior to the application of elastomeric roof coatings. Patching concrete, brick and masonry. Filling gaps in sidings and framed openings. Excellent roof sealant for small roof repair jobs. Highly flexible over a wide temperature range. Excellent weatherability and UV resistance. Provides a durable, weather resistant, long lasting seal. Easy to use, non-toxic, VOC compliant water based caulk. All surfaces to be caulked must be clean, dry and free of any oil, grease or dirt. EnergyGuard Acrylic Elastomeric Caulk is ready to use. Thinning is not recommended. Putty Knife: 4 inch, flexible blade. Brush: Good quality, stiff, synthetic bristle brush. EnergyGuard Acrylic Elastomeric Caulk is available directly from Fixallroof Coatings, from authorized distributors and online. 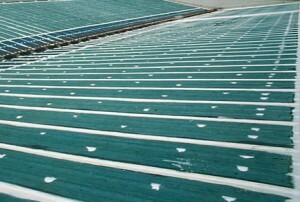 Contact Fixallroof Coatings for referral to a local Sales Representative or visit our website. Coverage: 65 lineal feet / gal for 0.45″ wide x 0.25″ thick strip. Caution: EnergyGuard Acrylic Elastomeric Caulk is a water-based roof sealant which will freeze and become unusable at temperatures below 32°F. Suspend all application if conditions prevent a complete cure before sunset, rain, fog, dew or freezing temperatures. Fixallroof Coatings must be completely dry before exposing to water or foot traffic. Keep Acrylic Elastomeric Caulk Coatings containers covered when not in use. Dispose of all containers in accordance with state and local environmental regulations. Keep away from children. If ingested, DO NOT induce vomiting. Call Physician immediately.